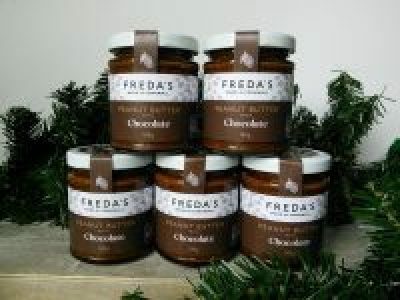 Freda’s Peanut Butter comes in a wide range of flavours: both smooth and crunchy Original; Chocolate; Chilli; Toasted Coconut; Cornish Sea Salt and Chocolate and Orange. Great on toast, but try Freda’s Toasted coconut on porridge with banana; or how about Freda’s Chilli with smashed avocado on toasted sourdough; and there’s Freda’s Crunchy with raisins and celery sticks. Also available is fudge and brownies.